MAKE SURE YOU HAVE YOUR BLACK SOCKS (LONG SOCKS!!!! COMPLETELY BLACK AND SHOES FOR REHEARSAL AND THE SHOW!!! 6.17pm: AFTER PERFORMANCE – ALL props and equipment return to trucks and bus to load. Students will stay near stadium for awards. ISSMA regional competition is the stepping stone to STATE finals. The top 10 bands from each site (north /south) must advance to SEMI-STATE at Ben Davis HS. Then those top 10 bands advance to State Finalist Lucas Oil Stadium on November 3. Video Photography: Due to copyright laws, absolutely no video recording of ANY performances are permitted. Photography at any ISSMA event may be used solely for local media and personal usage. Any sales or distribution of photos or videos from an ISSMA event distributed in a means other than from ISSMA official vendors is strictly prohibited. Admittance to the field is restricted to ISSMA certified photographers and event personnel. 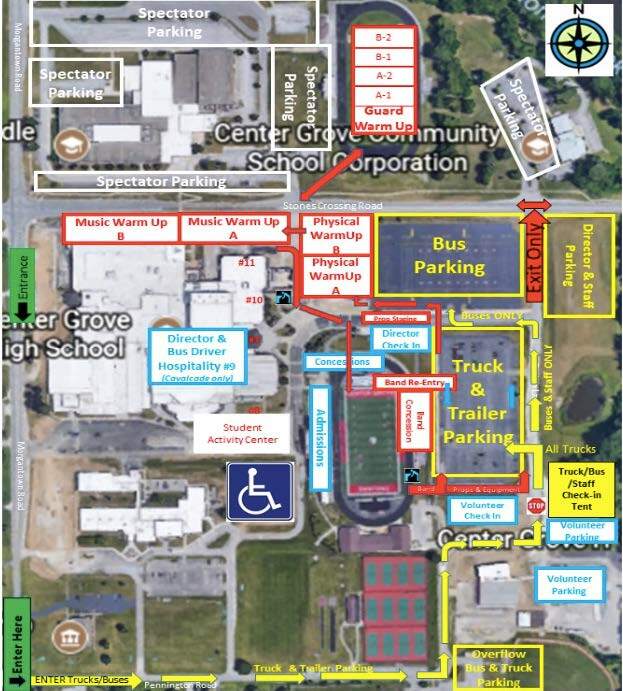 Gates will open one hour prior to the start of Class B. Tickets will be available at the two gates behind the home bleachers (west side of the stadium). Credit cards will also be accepted. Parking lot south of the high school (from Morgantown Road turn left onto Pennington Drive). Leaving Center Grove you cannot turn left (South) onto SR-37 from Stones Crossing. To get back to SR-37 and head South: Go left (South) on Morgantown Road, at the round-about take the 1st Right onto Whiteland Rd, then at the next round-about take the 1st Right onto 144. This will take you to a stoplight at SR-37.